We provide system architecture and underlying software for secure terrestrial and satellite-based messaging and tracking systems, including the interconnection of signal collection assets with command-and-control networks. The RDSS owner served as chief technology officer and system architect for satellite-based military Blue Force Tracking (BFT) systems including Movement Tracking System (MTS) and Force XXI Battle Command Brigade and Below (FBCB2), now called Joint Battle Command - Platform (JBC-P). The core radio technology is based on code division multiple access (CDMA) methods developed over the course of three decades. The determination of the position, velocity, and/or other characteristics of an object, or the obtaining of information relating to these parameters, by means of radio waves. The "L-band" is a general designation for frequencies from 1 to 2 GHz. However, the FCC uses the term "L-band" to denote only the 1545-1559 MHz and 1646.5-1660.5 MHz frequency band ("upper L-band") and the 1525-1530 MHz, 1530-1544 MHz, and 1626.5-1645.5 MHz frequency bands ("lower L-band"). The United States is the only country that distinguishes between the "upper" and "lower" L-band. 1978 On September 25, a Pacific Southwest Airlines Boeing 727 collides with a Cessna 172 in the skies over San Diego, California. All 135 passengers on board the 727 and the two pilots in the Cessna were killed. Seven people on the ground were killed by the falling debris, and an additional nine persons were injured. Both aircraft received voice notification of the approximate location of each other, however the National Transportation Safety Board determined that the probable cause of the crash was the failure of the 727 to maintain visual separation with other air traffic. One of those killed in the crash is a friend of Dr. Gerard ("Jerry") O'Neill. 1980 Work begins on a method of geolocation using two or more satellites. In September, Dr. O'Neill files a patent for a "Satellite-Based Vehicle Position Determining System." Called Triad, it is based on the use of three satellites to provide coverage to North America. It is eventually granted U.S. Patent 4,359,733 in 1982. Spread spectrum is a term applied to communications systems that spread radio frequency energy over a wide bandwidth by means of an auxiliary spreading code. The spreading of the bandwidth can be accomplished in many different ways and the systems are usually classified by the type of spreading technique which they employ. They are commonly referred to as: direct sequence (or pseudonoise), frequency hopping, time hopping, pulsed FM (or chirp) and hybrid systems. The spreading or dilution of the energy in spread spectrum systems over a wide bandwidth results in several possible advantages: short range interference-free overlays on other emissions, resistance to interference from other emissions, and low detectability. While we do not anticipate that spread spectrum will replace other types of modulations, the unique characteristics of spread spectrum offer important options for the communications system designer. 1983 Geostar Corporation is formed in March, based in Princeton, New Jersey. Application is made to the FCC in April for a license to construct the Global Satellite System (GSS). The system called for three geosynchronous satellites, located at 70° W, 100° W, and 130° to cover the continental United States and adjoining waters. The application indicated GSS would be able to locate an individual $200 transceiver as well as carry short (36-character) messages. Dr. O'Neill is interviewed for OMNI magazine. Geostar Corp of Princeton, NJ, proposes a satellite-communications system that would permit persons to send messages via satellite, using devices no bigger than pocket pagers. The system will locate the exact position of the sender, and handle messages of up to 36 characters. In its application to the FCC, Geostar states that a person confronted by a mugger could press a single button on his communicator. That would send out a signal that would go to three satellites in geostationary orbit over the Equator, and from them back to a computer on Earth. The computer would determine instantly the exact location of the sender by noting the difference in the time it takes for signals to reach the computer from the different satellites. It would then notify the nearest police car or station. The system would also be valuable to hunters and others lost in the woods, and would be of great value to trucking companies, who would make large savings if they could determine the location of - and communicate with - their trucks at all times. The proposal has not found favor in all quarters. The cellular radio services - some of whose alloted frequencies Geostar proposes to use - are particularly unhappy. AT&T and Motorola Inc., both of whom are heavily involved in cellular radio, have opposed plans of Geostar's type, stating that such systems would waste frequencies in serving remote areas; such frequencies could be used better in urban areas. SOUTH LAKE TAHOE, NEV. - A new satellite-based digital network, scheduled to be operational by 1988, will permit anyone in North America with a $500 hand-held transceiver to send and receive textual messages and data to and from any other location - without requiring ground-based connection facilities or large external antennas. The relatively low-speed scheme is a sort of data version of existing analog cellular radio technology, but on a nationwide scale. The project is the work of Dr. Gerard O'Neill, a longtime Princeton University physics professor who now heads Geostar Corporation in Princeton, N.J. O'Neill was granted an extensive patent by the U.S. Patent Office last year that, his colleagues say, covers 49 new technological claims. Many of these, relat ing to satellite communications, will reportedly make the scheme possible. Airline locator. The Geostar project was undertaken to provide a new, reliable, and highly accurate means of determining the exact positions and altitudes of commercial airplanes. Their locations will be tracked and compiled by a large central computer, which will facilitate air traffic control and, presumably, all but eliminate the threat of mid-air collisions. The plan calls for three satellites to be put in geostationary orbit and for a transceiver (transmitter/receiver) to be placed aboard the aircraft. The transceiver constantly listens for "interrogation" messages, sent via satellite from the central computer, and responds on a regular basis with a message that includes a unique identification character sequence. The three satellites each receive the response and relay it to the ground-based computer, which, based on the propagation delays of the responses, triangulates the plane's longitude, latitude, and altitude. The calculated location, Geostar claims, will be accurate to within 50 feet. Realizing that the scheme would also support locating mobile, ground-based targets - as well as two-way digital data communications from anywhere - Geostar went back to the drawing board and enlarged the scope of the plan. O'Neill says that plans are already under way by fleet owners and traffic managers to use the service to keep track of trucks and other ground vehicles. Battery-powered. Geostar conducted a test here recently of its data transmission capability, using leased satellite transponder capacity from another carrier. Geostar does not expect its own three satellites to be launched until 1987. Field trials have reportedly established that the scheme works. A portable data-entry terminal, transmitter, and power pack were employed in the tests. However, Geostar expects that by 1987 an integrated unit containing all of the components, including a miniscule two-inch dipole antenna for both receiving and transmitting, will be no larger than a carton of cigarettes. This unit, says Geostar, will be powered by a wristwatch battery. A great deal of power is not required to transmit to, or receive from, a satellite, but the Geostar plan represents a unique miniaturization of both antennas and power supplies. According to Geostar's Les Snively, the low-power requirement is sufficient for the way the transceivers operate. The "duty cycle" of the transceiver - the time that the transmitter is actually working - is only 20 microseconds. In that period, the unit sends a 256-bit block of some 36 characters to the satellite. This is done in response to a received interrogation signal, broadcast to every location 100 times each second. How often the transceiver is programmed to send these digital blocks (from several times a second to perhaps only once every few minutes) determines both the effective data rate for the user and the amount of power required by the transceiver. Even with a wristwatch battery, which Geostar acknowledges may be inadequate for extensive data transmissions or a sustained data rate of more than about a few hundred bits per second, a peak pulse power of 375 watts is achieved for the very short transmission burst. When not transmitting, the average amount of power used, says Snively, is "in the microwatt region." With a slightly stronger power supply, using a module that can readily be employed at home, in a car, or on a ship, a 300 bit/s data rate would be no problem, says Snively. Half-duplex. Another breakthrough in the Geostar scheme is the small dipole antenna. The handheld unit will reportedly contain an antenna only two inches in length that will receive messages from the satellite, then transmit the data bursts. The antenna size is consistent with the network frequencies; the entire three-satellite network uses the same up-link frequency, a 16.5 MHz-wide band centered at 1.618 GHz, and the same down-link frequency, centered at 2.492 GHz. The network operates digitally. Each up- and down-link supports an aggregate 12.5 Mbit/s, which is dynamically allocated to users in transmit time slots of 20 microseconds in duration. The control technique is basically time-division multiple-access (TDMA), which is a well-defined and long-employed method of handling access to a single satellite digital channel by a multitude of users. Geostar says that with this technique and the planned capacity, the three-satellite network will be able to support 100 million users. To further increase the capacity of the network, "spot beams" will be employed, which make the setup similar to a giant cellular radio arrangement. The satellites send messages down to users in one of 15 geographically distinct beams, each of which covers an oval-shaped area of land of about 300 by 500 miles. These beams overlap a little, but they permit the satellite to use only valuable down-link transponder bandwidth in the spot beam area where the user is located. Each spot beam transmits some 15,000 messages per second, for a total network down-link capacity of over 200,000 messages per second. The spot beams also permit transmission power to be focused, which is another reason why the tiny transceiver antennas will be able to receive transmissions that in other satellite networks without spot beams require dish antennas at least three feet in diameter. Users will be able to enter a considerable amount of text or data into the transceiver's buffer memory, but transmission will not begin until the operator first identifies the destination station, then hits the transmit key. Since a single buffer will be employed, users will first have to send their entire message before they can receive a message. Even so, logic in the transceiver works with the central computer to perform error-checking and acknowledge each burst of data. Forward error-checking is applied, but retransmission is invoked when errors are detected via a block-check algorithm. Studying uses. Geostar says that priority for network data traffic will be given to the aviation industry. Even so, user text and message transmission is expected to represent the bulk of the service. An insider says the entire air traffic control application is expected to use only 2 percent of the network's capacity. According to O'Neill, the capacity to transmit data over the same transceiver used in planes or trucks for positioning will still be there. He adds that airplane flight crews taxiing on runways might use the network, say, to send passenger or maintenance data to a central or regional computer site. Geostar is said to have spent almost $2 million developing the scheme. O'Neill says that $200 million will ultimately be needed to build and launch the three satellites needed to make the network operational. He says he expects other manufacturers to mass-produce the message transceivers (including wall-size map displays for tracking and positioning), adding that operational and interface specifications will be made available for this purpose, probably on a license basis. O'Neill and Geostar would naturally like the network to become the basis for a nationwide, ubiquitous, and inexpensive electronic mail service, and the firm is predicting prices that will likely be attractive to microcomputer users over, say, a phone line. The transceivers are expected to cost about $450 each, and the service is expected to be priced around $10 to $30 per month. O'Neill says that for data communications applications, this monthly service charge will likely be based on the volume of characters carried over the network. In November Geostar demonstrates a prototype system in the Sierra mountains of California using mountaintop pseudolite repeaters. A new satellite data network using low speed analog cellular technology will allow users with hand-held transceivers to send and receive text or data from any location without ground-based connections. Aimed at tracking commercial airlines, this network will also be used in business for tracking a local auto or truck fleet. Message transceivers will cost $450. The monthly service charge will be $10 - $30 per month. The project has been developed by Dr. Gerard O'Neill, former physics professor at Princeton who now heads the Geostar Corp. Nearly $2 million have been spent in development; $200 million will be needed for the satellites. 1984 The FCC decides to allocate frequencies to an operational satellite system for radio determination services. These decisions are issued in rulemaking Dockets 84-689 and 84-690 and codified in 47 CFR Section 25.392. Mr. Fowler. If I might, I was talking to the Chairman about a new area that absolutely fascinated me. I served a presentation the other day on a new technology called Geostar. It essentially involves putting three satellites up. You have a small unit which has a very small transceiver inside of it, and it costs, I think, about $100 ultimately. With this system you are able to send messages and receive messages to any person who subscribes to this. They can serve about 50 million people with this system in the United States, but because the signal goes up and is capable of being triangulated by the different locations of the three satellites, your location can be determined within three meters anywhere in the United States. So if you are lost in the forest, they will be able to locate you within three meters. People who have fleets of trucks will be able to know exactly where their trucks are. The aviation industry is looking at this, be- cause if one of these is put in each plane, and by using a computer system and programs, the computer would be able to instanta- neously alert any plane, small or large, that was on a collision course with another airplane well in advance. This could, once and for all, eliminate the possibility of collisions. It is an amazing system. I haven't looked at it to see whether it is as technically sound as they say it is, but apparently it has received a lot of good reviews. We will be looking at that. That is an example of something I wanted to mention this morning. The only reason I do that is because this Committee, more than most, is always interested in some of the new stuff coming down the road, and I thought I would mention it to you. Mr. Porter. You are probably in one of the most fascinating areas of the economy and of the government that exists, so we are always interested in these new ideas. Mr. Fowler. Thank you, Mr. Porter. Despite his many other interests, it is the Geostar Corporation which currently occupies most of O'Neill's time and effort. Geostar, a development firm concerned with communication and navigation via satellite, is a perfect blend of O'Neill's farsighted vision and his make-it-work practicality. The system which O'Neill and his colleagues are developing could revolutionize how we track and monitor aircraft and how we communicate with one another. Initially, the proposed system would have three satellites in geosynchronous orbit over North America. The Geostar central computer facility would use the satellites to route tracking and communication data almost instantaneously for everything from commercial airlines to trucking companies, taxi services, police departments, and even individuals. The key to the system will be a hand-held transceiver which can send and receive messages through the Geostar network. During the interview, he remarked that an airplane thousands of feet above Princeton was in the process, at that moment, of testing the Geostar system. COMPUTE! : There are predictions that by 1988 some 50 million homes in the U.S. will have personal computers. In what ways do you see this increased awareness of computers affecting America's technological edge in the world? O'Neill: I think it will help a lot. It's already true, just because of the accident that we work on an alphabet and the Japanese work, of course, with a character-based system, that we as a people are far more familiar with keyboards than they are. Young Americans growing up nowadays, working with personal computers, are much more familiar with keyboards, much less scared of them, than the older generation. Geostar is a digital system, a keyboard-type system. It's not a voice system. It could be connected to a personal computer anytime. The message transfer capability is entirely consistent with the kind of telecommunications that you like to carry out with your personal computer, from a portable computer. And, of course, by 1987, today's three or four pound computers that fit in a briefcase are probably going to be shrunk down to a quarter of an inch thick. You can carry those along with a Geostar transceiver, and be in instant touch with anywhere. COMPUTE! : You have already completed mountaintop and airplane emulations of the Geostar satellite functions. What's the timetable for the actual satellite? O'Neill: So far, the company has met all of its milestones. We are looking to begin service to the entire continental United States in 1987. One of the most critical items for that is the issuance by the Federal Communications Commission of what's called a "notice of proposed rule-making," which would allocate the spectra for the Geostar service. And that is going very well. There's a very strong possibility that something important will have happened in that area even before your magazine comes out. The development of the transceivers actually takes just about as long as the development time for the satellites themselves. It's a different kind of technical task, but the time scales are about the same. COMPUTE! : What types of services will Geostar provide? O'Neill: In aviation, the kinds of services that would be provided would be, for example, positioning, very accurately.on the order of meters. We can technically provide what's called radio location, which means feeding back the location of a vehicle or an aircraft to a fleet dispatch headquarters. We can provide for aircraft terrain avoidance, because we will have the stored terrain map. So if we see an aircraft heading toward a TV tower or a mountain, we will be feeding warnings to the pilot at the time. There would be, of course, a two-way digital message service, all provided through the same device. And you could send a message from any transceiver to any other transceiver with a typical delay of about six-tenths of a second. And lastly, it is also an emergency warning system, because the ground station computer will be tracking aircraft. And if you see an aircraft which is heading toward a collision with terrain, first of all, you'll be sending warnings, automatically generated by the computer, and if the aircraft does crash, you will recognize the fact from several confirming sources. And that's important, because the so-called emergency locating transmitters (ELT) that are now federally mandated and carried by aircraft have a horrendous false alarm rate.approximately 98 percent of all ELT firings are false alarms. COMPUTE! : How would Geostar have an impact on aviation? O'Neill: The way that Geostar would affect aviation is sort of generically the same way that it would affect a number of other situations in life and affairs. The difference is that in aviation, all the needs come together in one place. The fundamental thing is that the Geostar transceiver is a very light, simple, inexpensive thing, which in effect can run on double-A cells. It's a goal which the manufacturers regard as not at all impossible. 1985 RCA Astro contracts with Geostar in April to develop an L-band inbound (mobile unit to central hub) transponder. In November, Geostar signs a Space System Development Agreement (SSDA) with NASA for satellite launch services. 1986 GSTAR-2 is launched on March 11 carrying a Geostar payload, but suffers catastrophic failure during on-orbit testing in late May. In August the FCC officially completes the rule-making process for the RDSS frequencies. They grant three licenses -- one to Geostar, one to MCCA Radiodetermination Corporation, and one to McCaw Space Technologies, Inc.
SATRACK - Was initially conceived in 1982 to determine if satellite tracking systems could be used in support of various Customs enforcement activities. The satellite system should provide position and tracking functions at a very minimum. Three systems have since been identified that could meet Customs operational requirements. They are the Global Low Orbiting Message Relay (GLOMR) satellite now being operationally tested by the Defense Advanced Research Projects Agency (DARPA). The second system is the NAVSTAR Global Positioning System (GPS), a multisatellite system being established by the Department of Defense as a very accurate position location system for mobile units. The third system is the GEOSTAR system. Electronic Identification Tag (EIT) System - Since 1982 Customs has conducted experiments under project SATRACK to determine if satellite tracking (position location) systems could be used in support of Customs law enforcement activities. Customs requires a system which provides continuous coverage extending from the U.S./Canada border to northern South America, with tag position data updated in real time. ln 1986 Customs generated the performance specifications for the development of a miniaturized Electronic ldentification Tag (ElT) system which would operate with a geosynchronous satellite. A number of potential contractors were selected to compete in the contract bidding process. Inmarsat will provide free capacity on one of its satellites to the US Geostar Corporation for tests and demonstrations of a land mobile position reporting and communication satellite service. The request for experimental capacity was received by Inmarsat from its US Signatory member organization, Comsat Corporation. The purpose of Geostar's proposed experimental programme is "to test the use of satellite communications for position reporting in the land mobile environment." The test and demonstration will be carried out with 30 vehicle terminals sharing a single L-band to C-band frequency channel in random access mode. The programme is expected to start about the end of 1986. "Inmarsat's in-principle agreement to this request is in line with its long-standing policy of providing free access to its satellites for experiments which promise the possibility of expanding and improving mobile satellite communications technologies and applications," Inmarsat's Director General, Olof Lundberg, said. "This is in fact the 24th programme of this nature supported by Inmarsat." However, Mr. Lundberg emphasized that, since 1979, Inmarsat and its forerunner Marisat had provided services which had enabled both automatic position reporting via satellite from ships and other mobiles, and the interrogation of mobile position information from customer premises (polling). This service is now widely used by mobiles equipped with Inmarsat Standard-A communications terminals. "With the introduction in the next year or so of Inmarsat's new low-cost miniature Standard-C communications terminals, we expect the use of the Inmarsat system for this type of application to increase greatly," he said. "Next year, we shall also conduct experiments, using our satellite system, into position determination by ranging as well as another series of trials in support of other navigation systems." Eight transportation companies trial more than 100 user terminals, including Mayflower Transit. Geostar moves their corporate headquarters and processing center from Princeton, New Jersey to K Street in downtown Washington, D.C. Following its 1985 allocation of frequencies for a Radiodetermination Satellite Service (RDSS), the Commission in 1986 authorized a system design that would permit multiple RDSS systems to operate simultaneously on the same frequencies to provide RDSS and ancillary non- voice message service, and authorized the three proposals before it that conformed to the adopted design. A fourth applicant subsequently amended its nonconforming proposal, and its application was granted in March 1987. While two of the licensees have decided not to proceed with their systems, one, Geostar Corporation, has begun to provide start-up service by placing RDSS packages on domestic fixed-satellites. RDSS packages were authorized to be added to several GTE Spacenet satellites for Geostar in 1987. 1988 GE Americom Spacenet-3 is launched in March with an RDSS L-band receive-only package. Users transmit a direct-sequence spread spectrum burst at 1618.25 MHz. The burst has an 8 MHz chip rate and a 15.6 kHz data rate. User terminals transmit their position, derived from an on-board LORAN-C receiver, to Geostar Central for delivery to the customer. A return link at 2491.75 MHz is in the planning stages, but for now the Geostar service is one-way only. Geostar acquires an 11.5 percent stake in Locstar, a consortium made up of European companies and government entities including British Aerospace and Alcatel. The consortium plans to provide RDSS in Europe, the Mideast and North Africa. European patent EP 0174540 is granted to Geostar Corporation. In November, San Diego-based Qualcomm, Inc. begins offering their two-way OmniTRACS mobile communications service via Ku-band satellite (two transponders on-board GSTAR-1). Qualcomm had purchased a smaller company called Omninet that had developed the system. The FCC granted Qualcomm an STA (Special Temporary Authority) in September for 2,000 terminals. A space industry survey conducted by the U.S. Department of Commerce forecast worldwide annual revenues from RDSS systems were expected to reach $150 million to $200 million by 1992, and total $1 billion or more in 1995. Part of the increase in revenues is attributed to production economies of scale for RDSS terminals, with user equipment declining in price from about $4000 to less than $500. These estimates were obtained from suppliers and were not independent government forecasts. The Geostar forecast indicates costs declining from $3,000 for first generation terminals to less than $500 in mass production. Following its 1985 allocation of frequencies for a Radiodetermination Satellite Service (RDSS), the Commission in 1986 authorized a system design that would permit multiple RDSS systems to operate simultaneously on the same frequencies to provide RDSS and ancillary non-voice message service, and authorized the three proposals before it that conformed to the adopted design. A fourth applicant subsequently amended its nonconforming proposal, and its application was granted in March 1987. While two of the licensees have decided not to proceed with their systems, one, Geostar Corporation, has begun to provide start-up service by placing RDSS packages on domestic fixed-satellites. RDSS packages were authorized to be added to several GTE Spacenet satellites for Geostar in 1987 and 1988. Although it has experienced some technical difficulties, Geostar is currently providing start-up RDSS service to customers using the Spacenet III satellite launched in March 1988. 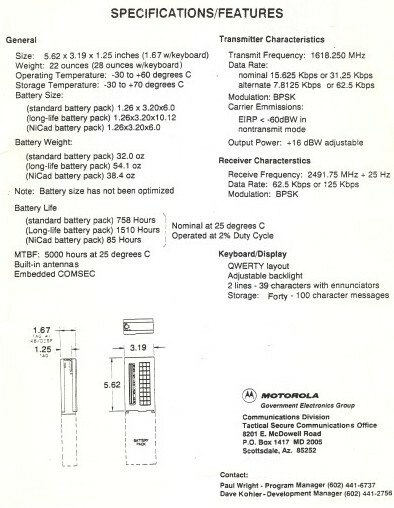 1989 A typical installation costs about $3,300 for transceiver, antenna and keyboard. The Geostar link runs $45 a month for one transmission per hour, 24 hours per day, and a nickel for each additional transmission. In October Geostar begins offering two-way service by transmitting an "outbound" signal (from the central hub out to mobile terminals) between 3700 and 4200 MHz (C-band). (This was known internally as System 2C.) Although the C-band frequencies were originally allocated for Fixed Satellite Service (FSS), the FCC allowed mobile operation in the band due to a lack of S-band satellite capacity in the allocated RDSS band (2483.5 to 2500 MHz). Equipment is built by Hughes Network Systems (L-band transmitter), Kenwood Corporation (C-band receiver) and Sony Corporation (L-band transmitter). In the RDSS system, a continuous outbound signal is transmitted to provide time reference marks and an outbound time division multiplex data stream. To determine the position of a mobile unit, the mobile unit retransmits one of the time reference marks, adding its unique identification code, through two or more geosynchronous RDSS satellites. The position of the mobile unit is calculated at the central earth station from the round trip propagation times through three satellites, or by the round trip propagation times through two satellites and altitude information obtained from a digitized terrain map or on-board altimeter. The relative positioning accuracy of the RDSS system is less than ten meters and the absolute ranging accuracy is under fifty meters. In FY 1989, Geostar Positioning Corporation continued to implement its plans to construct and launch a radiodetermination satellite service (RDSS) system. In addition to continuing construction on its three dedicated RDSS satellites, Geostar has been authorized to provide interim service using capacity on domestic fixed-satellites. In 1989, the Commission authorized Geostar to use domestic fixed-satellite C-band frequencies for the interim system's downlink transmission from GTE Spacenet fixed-satellites to the mobile user units. This link permitted Geostar to provide two-way communications capability on its interim system. 1990 In February, Geostar demonstrates RDSS technology to remotely determine the position of a mobile platform. The demonstration shows the ability to determine position to an accuracy of better than 50 meters, using just two geostationary satellites and a digital terrain map. Q: At the hearing, you testified that the Customs Service is part of a consortium of military and civilian agencies developing "an innovative satellite based covert tracking system with many law enforcement and defense applications." Please describe the project. A: The project to develop the satellite based tag is called the Electroic Identification Tag (EIT) system. At present, Customs is under contract to develop the tag. Geostar, the prime contractor, manages the project, and Motorola, the subcontractor, is developing the commandable device. The contract was awarded in September 1986; 70 prototype tags are scheduled for delivery in October 1991. Q: Has consortium selected a system and what is the time frame for deploying it? A: Customs and consortium members have selected Geostar's System 3.0 which was scheduled for deployment in November 1991. However, because of fiscal problems, Geostar recently announced that the satellite launch for System 3.0 has been rescheduled for calendar year 1993 time frame. We are exploring means to minimize the impact of this delay. Q: Is this expected to operate off an existing satellite or do you plan to deploy one? A: The EIT device is designed to operate with a future commercial satellite to support System 3.0. The System 3.0 satellite launch schedule is given above. Customs and consortium members have no plans to launch, nor deploy another satellite to support the EIT device. Q: Are there other, similar consortia of both military and civilian agencies working on satellite systems together? A: Under the aegis of the Science and Technology Committee, there is presently a Satellite and Technology Working Group of military and civilian law enforcement agencies whose objective is first, to identify the individual satellite technology requirements for the participating agencies, and second, to implement these requirements. The satellite applications being pursued are communications, tracking/monitoring, position/location and navigation. Currently, a requirements, capabilities and deficiencies report for the participating agencies is being published and will shortly be forwarded to the respective agencies for approval and acceptance. The implementation phase will include a design and architecture effort that will identify government and industry satellite service providers to determine the most cost effective source for this service. Q. How will the civilian and military agencies distribute control of the project once it is working? A. At present, there is no need or plan to distribute control of the project once the EIT tag is working. Upon completion of the project, the objective of the consortium will have been met and the consortium will be disbanded. Q: Who will control the information? A: All EIT information will be collected at Geostar Central for distribution to each subscribing agency. Hence, control of the information will be the respon- sibility of each agency. However, this does not preclude individual members from cooperation and sharing information with each other. With respect to Customs, information derived from Geostar Central will be directed to Customs facilities for enforcement actions. In April, a secure, handheld satellite transmitter prototype built by a division of Motorola (now part of General Dynamics) is demonstrated. In July, at the Second International Mobile Satellite Conference, Geostar reports that it is currently providing more than 65,000 position reports (derived via LORAN-C) and messages each day to more than 70 commercial and government customers. 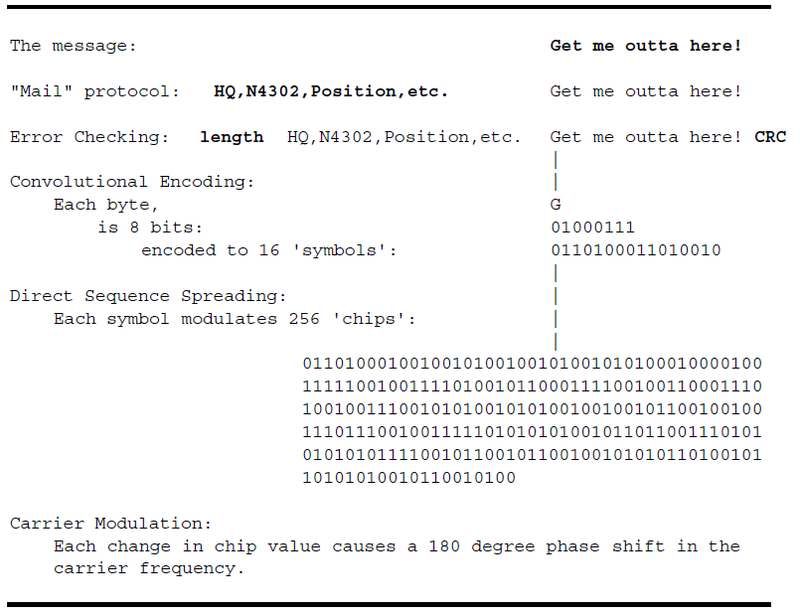 Mobile units transmit a burst containing position and status information, as well as an alphanumeric message of up to about a hundred characters, at 1618.25 MHz in the band allocated for RDSS. The transmission is a direct sequence, spread spectrum signal, with a duration of 20 to 80 milliseconds per transmission packet. This signal consists of 15.625 kilobit per second data, rate-1/2 encoded for forward error correction, spread by a direct sequence pseudo-random noise code operating at 8.000 megabits per second. The spread signal is BPSK modulated and occupies about 16 MHz of bandwidth. The RDSS relay on board the host domestic fixed satellite retransmits these signals to Geostar's central earth station and operations center in Washington, D.C., using the conventional 11.7-12.2 GHz domestic satellite band. A C-band (4/6 GHz) link using commercial fixed satellite transponders provides communications from Geostar central to the mobile terminals. This outbound link to the mobile terminals is a continuous signal, which is framed and contains message packets addressed to mobile users. This signal consists of 1200 bit per second data, rate-1/2 encoded for forward error correction, spread by a direct sequence pseudo-random noise code operating at 1.2288 megabits per second. The spread signal is BPSK modulated. Two such signals can be transmitted over the same transponder. Geostar is currently using an uplink earth station provided by GTE Spacenet to transmit this signal to the satellite, with landline connections between that earth station and Geostar's operations center in Washington, D.C.
Also in July, Geostar is granted U.S. patent 4,943,974 for Detection of burst signal transmissions. The Geostar inbound (transceiver to ground station "hub") transmission was a direct sequence spread spectrum burst which consisted of an acquisition aid ("preamble") and a payload. The acquisition aid was a configurable sequence of pseudo-noise (PN) chips which allowed a hub burst receiver to detect the transmission. The payload contained convolutionally encoded user data. Geostar Positioning Corporation commenced two-way start-up radiodetermination satellite service in the United States in 1989. The radiodetermination satellite service (RDSS) continued to develop in 1989. This service was authorized in 1986 and allows subscribers to determine latitude, longitude, and altitude, and to exchange brief coded messages using hand-held or vehicle-mounted transceivers. Geostar Positioning Corporation, the licensee in this service, continued construction of its three dedicated RDSS satellites, which are to operate in the frequency bands allocated for RDSS. Geostar also commenced two- way start-up service in 1989 by using capacity on domestic fixed satellites on a non-interference basis. Geostar declares bankruptcy in February. This agency [U.S. Customs Service] does not engage in much original research directly related to counter terrorism. However, Customs has supported considerable work in the area of drug detection and interdiction, some of which is of ancillary utility to the war on terrorism. The largest portion of the R&D money mentioned above (about $3 million per year) has been devoted to development of a covert remote locating system (known as Geostar). Signals from a small device hidden on an object will be picked up by a pair of Earth satellites. By triangulation, the location of the object can be determined. This project is a cooperative effort with other agencies and groups, including the TSWG [Technical Support Working Group]. 1992 Motorola, deep in the planning stages for their Iridium project, purchases Geostar's RDSS licenses at Geostar's bankruptcy auction for $50,000. Several commercial two-way (active) positioning systems have been in the planning stages. One, GEOSTAR, had undergone some initial testing, but the corporation went out of business. GEOSTAR proposed the first continentwide communication and positional system. It was targeted at the transportation industry for identification, location monitoring, and communication to commercial vehicles. Electronic map displays in automobiles were a target application. GEOSTAR planned access through a subscription service. Accuracies were expected to be 10 to 50 meters. BLM used the communication component of GEOSTAR's first satellite to successfully test aircraft flight-following to assist in more accurate aircraft locations in emergencies. This very successful test used LORAN C-derived coordinates transmitted from aircraft to the GEOSTAR satellite, then to a ground station for display on a computer screen. 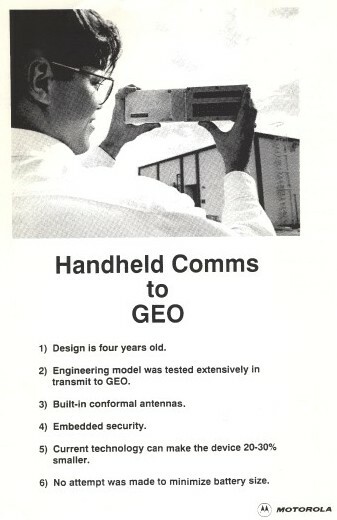 Testing of GPS positions for flight-following was started with GEOSTAR went out of business (BLM, 1991). BLM plans to continue aircraft flight-following using other communications satellites. 1991 Newcomb Communications is founded in New Hampshire. 1993 FCC authorizes Newcomb Communications to operate 10,000 mobile units that provide one-way position reporting using the Spacenet-3 satellite. This authorization was set to expire when the first "Big LEO" began to operate, since the spectrum in question had been reallocated to the Mobile Satellite Service (MSS). 1994 In December, Newcomb demonstrates their mobile transceivers on the Cajun Queen river boat and the Coast Guard cutter Saginaw, operating in and around New Orleans, Louisiana. The final communications system of the three to be discussed is the Newcomb Satellite system. This is a geostationary satellite system using the RDSS band (1608.1626 MHz) and is a successor to the defunct Geostar system. The shipboard equipment consisted of a Newcomb CP-1 direct sequence spread spectrum (DSSS) satellite transmitter with integrated GPS receiver. The same radiobeacon receiver used in the previous two systems was used here to provide differential corrections to the GPS receiver internal to the Newcomb CP-1. The CP-1 was connected to a small, flat Lband antenna and a very small, flat GPS antenna. The ADS data was generated by the internal GPS receiver and then automatically transmitted by the CP-1 as a data packet every 10 seconds. 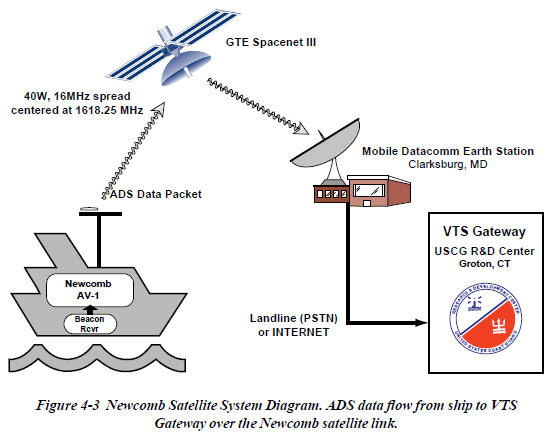 The Newcomb CP-1 transmissions were relayed by a geostationary satellite (GTE Spacenet III) and received at the Mobile Datacomm (MDC) satellite earth station in Clarksburg, MD where they were placed into the R & D Center mailbox on the MDC computer system. A Link Control Computer at the VTS Gateway was connected to the MDC computer either via modem and the PSTN or via Internet and pulled data reports out of the R & D Center mailbox in real-time. This information flow is illustrated in Figure 4-3. The analysis of the data showed the system to work very well. Each data packet transmitted was sequentially numbered by the CP-1. Thus it was possible to measure the percentage of packets making it to the VTS Gateway. Overall, the figure was about 96%. The actual system performance was better than this though. It was discovered that the .omnidirectional. antenna had two nulls in the radiation pattern. Further testing and analysis showed that packets were received 99.9% of the time except when operating in the pattern nulls. This system has the largest capacity of the three tested. Due to the extremely short transmissions and the nature of spread spectrum modulation a very large number of users can be supported in this bandwidth (>100,000). The real limit on the number of users is the processing power of the Earth Station. Currently this is around 20 transmissions per minute according to MDC, but based on our use of the system, this is underestimating the capability. There is also the future potential to increase capacity by using multiple earth stations, each one with it's own pseudo-noise (PN) code. The Newcomb system appears to be a good candidate for ADS based VTS systems. There are many advantages: The system has a high capacity as discussed above, there is room for future expansion by adding new earth stations using different PN codes for the DSSS signal, equipment is small and easily installed, and there is no infrastructure to create or maintain. Furthermore, a single Link Control computer at the VTS Gateway can handle any number of Newcomb transmitter equipped vessels, communications service costs are lower than for cellular, reports are received very quickly, and due to the high capacity of the system mobile units can report in at shorter intervals. Finally, the satellite footprint is CONUS plus 200 miles offshore, so the same system can be used all over the USA without any CG maintained shore installations. The only disadvantages to the system are the cost of the shipboard equipment and the cost of the MDC service which is still fairly expensive although it is less expensive than cellular. The AV-2 transmit/receive mobile terminal design requirements and product development plans were based on the experience of the founders of Newcomb Communications in the application of the Geostar system to transportation operations on land, sea, and air. As a small start-up company with limited resources and financing, a pragmatic approach was adopted that recognized the limited resources, lack of test equipment, and budget constraints. These constraints, however, were to a large part offset by the knowledge, experience, and close-knit working relationship of the design team. Newcomb Communications began developing its own Fixed Earth Station (FES) to operate in conjunction with the Newcomb mobile terminals. The FES reception and decoding subsystems were developed and a prototype was demonstrated to the Coast Guard and Army in May of 1993. This demonstration included the ability to detect, decode, and display messages transmitted by a CP-1 unit via the Spacenet III satellite using Geostar PN coding and the Mobile Datacom (MDC) Earth Station (located in Clarksburg, MD). Then, using a different PN code, the same demonstration was given using the Newcomb prototype FES. Subsequent to this major milestone, the Company established an agreement with Mobile Datacom Corporation (MDC) whereby the Company would use MDC's Earth Station and satellites. This provided the opportunity to focus the Company's engineering resources on the development of the mobile terminal products, while MDC addressed the operation of the satellite and Fixed Earth Station. The MDC Earth Stations were originally built by COMSAT for the Geostar system in the late 1980's. The technology used for signal acquisition/decode is Surface Acoustic Wave (SAW) delay lines. SAW delay lines were used because Digital Signal Processing (DSP) devices were not yet available. MDC has re-installed this FES/Hub system on the COMSAT campus at Clarksburg, MD. They have also installed a modulator for the outbound (C-band) messaging at a commercial common carrier earth station located in Carteret, NJ. The facility is connected to the MDC Hub by a leased telephone line. 2000 In February, Newcomb Communications becomes Outerlink Corporation. 2002 In June, the FCC grants Outerlink a three-year license for 20,000 full-duplex transceivers to operate over the AMSC-1 satellite. These transceivers receive a 5 kHz forward link between 1530 and 1559 MHz and transmit a 3.5 MHz-wide direct sequence spread spectrum (DSSS) burst between 1638.5 and 1642 MHz. 2004 In January, Digital Angel Corporation acquires Outerlink Corporation. 2006 In June, Outerlink wins a $3.2 million contract from the South Carolina Army National Guard to demonstrate their Automatic Flight Following System (AFFS). 2007 Paul Newcomb leads a group of employees to buy back Outerlink from Digital Angel Corporation. 2011 In March, with their business focused on aviation, Outerlink exhibits several products and services at HeliExpo in Orlando. At this point in time Paul Newcomb is dividing his time between New England and Florida. 1993 Mobile Datacom Corporation is started as a spin-out from Maryland-based Comsat Corporation, headed by former Comsat Systems Division President Joel Alper. It is headquartered on the campus of Comsat Corporation in Clarksburg, Maryland on the second floor of the Satellite Control Facility (SCF). Comsat was a Geostar creditor and had acquired much of Geostar's equipment and technology from the bankruptcy court. This included the RDSS hub and computers as well as an inventory of Hughes-built mobile L-band transmitters and Kenwood-built C-band mobile receivers. 1995 FCC authorizes Mobile Datacom Corporation to operate 10,000 mobile units that provide two-way position reporting and data communication using geosynchronous satellites Spacenet-3 and GSTAR-3. This effectively reinstituted Geostar's service. As with the Newcomb license, this authorization was also set to expire when the first "Big LEO" began to operate. Motorola's Iridium satellite network was the primary concern. The transmitter fires a direct sequence spread spectrum signal at 1.6 GHz (L Band) lasting no longer than 80 milliseconds. This signal is received by a geostationary satellite with L band capability (Spacenet 3R) and transponded to the ground station at Ku band. The signal is acquired and decoded at the ground station by one of two hub units. The decoded packet is then delivered to a pair of Hewlett-Packard 9000 series computers (known internally as "Ren" and "Stimpy") for further processing and delivery to the customer. A packet destined for a mobile unit is uplinked to a geostationary C band satellite (Comstar D4). The mobile receiver is locked to the C band carrier and demodulates incoming packets in a manner similar to the inbound path. Transmissions have superior LPI/D (Low Probability of Interception/Detection) characteristics, making them an excellent choice for clandestine messaging in a hostile environment. Inbound and Outbound channels are available to all units at all times, allowing for instantaneous two-way messaging. Mobile Datacom begins work on a vehicle tracking and messaging system for the United States Army. This effort will become the Movement Tracking System, a $419 million contract awarded to the company in 1999. Preliminary equipment and software is tested at Fort Hood, Texas and demonstrated at the US Army's National Training Center (NTC) at Fort Irwin, California, achieving some of the highest asset utilization scores ever recorded. 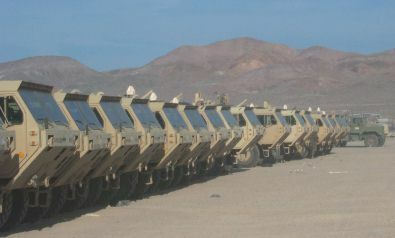 1996 Mobile Datacom continues to demonstrate the MTS concept in July at the US Army's National Training Center (NTC) at Fort Irwin, California. The system is used heavily during exercises and is a critical link to coordinate medical helicopter rescue after a vehicle accident where no other communications links were available. 1997 In September Mobile Datacom is awarded a two-stage development contract from the Defense Advanced Research Projects Agency (DARPA). The first stage of the contract provides funding for the development of a second-generation satellite-based network. Also in September, Mobile Datacom completes an Advanced Concepts and Technology (ACT) II Program for the US Army Combined Arms Support Command (CASCOM) after a final convoy demonstration from Fort Stewart, Georgia to the Port of Savannah. The ACT II demonstration integrates a Radio Frequency Identification (RFID) interrogator, a SAE J1708/J1587 Vehicle Data Bus interface and a ruggedized laptop computer with a GPS-equipped satellite transceiver on a mobile military platform. The computer provides a moving map display and a two-way text messaging capability in a software program called MTS Messenger. Data transmitted from each platform is collected at a satellite Earth Station in Ellicott City, Maryland and made available on a series of web pages. Position and status information collected from each vehicle, processed in a software application called BField (short for battlefield), is broadcast back out via satellite to all vehicles. Through funding provided by a recently awarded contract from the U.S. Government's Defense Advanced Research Project Agency (DARPA), as supplemented by investor funding, Mobile Datacom will develop its next generation system to be multi-platform capable. This will make Mobile Datacom the only service provider in the business able to offer customers the choice of which satellite system to use with the same hardware/software combination. This will be accomplished by designing the MDC spacelink and physical protocol layers to accommodate other satellite relays as they become available while leaving external interfaces to the mobile terminal and the satellite gateway the same. Systems through which the Mobile Datacom Network will be able to operate include American Mobile Satellite Corporation (AMSC) (available today), TMI of Canada (available today), Globalstar, Odyssey, and other systems in which the satellite functions as a bent pipe relay, permitting the transmitted signal to pass through the satellite without any processing. Since many customers and VARs want their own private networks, the Company will provide a wide range of virtual private network services. The Company's network architecture allows it to offer customers their own piece of the system, to manage as they choose. In April, technical work begins on the design of the next generation satellite transceiver, later named the MT-2010. In September, the U.S. Army Training and Doctrine Command (TRADOC) approved the operational requirements for MTS. Soon after the Program Executive Office (PEO) for Standard Army Management Information Systems (later the PEO for Enterprise Information Systems) received program management responsibility for MTS. In October, Comtech Telecommunications of Melville, New York, purchases Mobile Datacom. 1999 In June, the U.S. Army awards Comtech Mobile Datacom a $419 million IDIQ contract for Movement Tracking System (MTS), a satellite-based, logistics-oriented tracking and messaging system. 2000 In January, Comtech Mobile Datacom begins work with the Dominguez Hills division of TRW (later to be purchased by Northrop-Grumman) to determine a way to provide satellite service to the U.S. Army Force XXI Brigade and Below (FBCB2) program using existing MTS L-band transceivers. At this time, the FBCB2 program relied solely on terrestrial, line-of-sight radios to communicate in a mesh network, however when a vehicle moved out of sight it would lose connectivity and drop out of the network. Satellite-based networks held the promise of greatly improved network coverage and connectivity. In April, MTS passes operational testing with the 180th Transportation Battalion, 13th Corps Support Command (COSCOM), at Fort Hood, Texas. 2002 In October Brigadier General Mazzucchi, as the Designated Approval Authority (DAA), signs the Initial Authority to Operate (IATO) paperwork for FBCB2 Blue Force Tracking (BFT). This clears the way for Comtech hardware and software to be used in Operation Enduring Freedom (OEF). [The article] is very interesting and confirms my view of what the future holds for systems such as Comtech's. To our very great credit, the satellite system, and the operating software and applications worked. Now, the warfighters have a taste for what is available, and a very clear idea of shortcomings. That is to say, they see what is being done, and now they understand how it can work for them, were it to have been designed with their specific needs in mind. While this always comes down to questions of time and money, there is going to be a big push to put in place the systems that work the way the warfighter wants them to work, since now it's only a matter of, as I indicated, time and money. Time isn't a factor, since they can use what they've got in the interim, and money, well, there's a lot going to be spent, so why not on bandwidth and software. The challenge comes from the possibility that the future system will not be a derivative of the exisiting system, but the result of a totally new development, like JTRS [Joint Tactical Radio System]. That could come out of NG [Northrop-Grumman], or GD [General Dynamics], or any of the large (or small) systems integrators. Comtech will need to get on board, somehow, or the train will leave them at the station. [This] article is the first I've seen, and undoubtedly not the last, reflecting the real needs. And those needs will be met. The Army isn't going to grow, so it's the systems that will have to maintain the effectiveness of the small fighting force. Great selling point if you can make the connection. J. Preston Windus, Jr., a Comtech corporate financial officer, takes over management of the Mobile Datacom division. In September, installation of MT-2011 satellite transceivers NATO vehicles in Kosovo begins. These units will provide messaging and location data for peacekeeping operations. Position location is provided by the Globalstar constellation rather via the GPS satellite system. The satellites calculate position using radio frequency (RF) time difference of arrival (TDOA), frequency difference of arrival, angle of arrival or a combination of the geolocation methodologies. Accuracy of the positions is up to 10 km. Incidentally, this type of positional technology is similar to Radio Determination Satellite Service (RDSS) created by GEOSTAR in the 1980s and currently owned by Comtech Mobile Data Corporation (CMDC). RDSS establishes geolocation by radio frequency TDOA using two or more satellites in geosynchronous orbit. CMDC currently uses GPS along with the two-way communication capability of RDSS to provide location data in its movement tracking system service, which is enabled by Inmarsat constellation. Although GPS technology seems to be the favorite for geolocation, RDSS is worth investigating. A clarification to the thesis would note that CMDC licensed Geostar technology from Comsat Corporation, who owned the rights after Geostar's bankruptcy. 2004 By May there are about 3,700 MTS-equipped vehicles operating around the world, including more than 2,000 in Iraq and Kuwait. "Dan Wood has the ideal background and skill set to take over the reins from Pres Windus at Comtech Mobile Datacom. His strong operations and finance experience is very similar to that of Pres." Like Mr. Windus, his background is financial rather than technical and is lacking in any significant mobile satellite industry experience. [C]ommercial L-band bandwidth, network management services, engineering design and development services, and L-band satellite transceivers for Fiscal Year 2007 (FY-07) and beyond supporting US Army FBCB2 BFT operations Worldwide. Optional - A source of supply for engineering services capable of reverse engineering the firmware contained within the CMDC MT-2011 and CMDC hub and packet switch equipment to provide a more secure and more capable waveform to support FBCB2 BFT operations. NOTE: The Government does not own the design rights to the CMDC MT-2011 transceiver, CMDC hub equipment, or CMDC packet switch, nor does it have any drawings or documentation that describes the design and operation of this equipment. The Government does own CMDC MT-2011 transceivers and CMDC packet switch equipment that can be provided for purposes of reverse engineering. Also in May, Comtech corporate tells the Government that it had not agreed to allow CMDC to license any proprietary information to the Government at any price for use in future competitive procurements. At time, CMDC estimated that the value of their ongoing business operations, and the potential risks associated with releasing the proprietary data to competitors in the industry would be valued (if a value were to be assigned) in excess of $100 million. 2007 In April, FBCB2 Prime Contractor Northrop-Grumman awards an initial $9.3 million contract to California-based ViaSat, Inc., a Comtech competitor, to develop a faster satellite-based Blue Force Tracking system. In August, the Federal Communications Commission (FCC) issues a Letter of Inquiry ("LOI") regarding whether CMDC violated section 301 of the Communications Act of 1934 and sections 25.102, 25.117, 25.136(d) and 25.276(a) of the Commission's Rules by modifying and operating its MET [Mobile Earth Terminal] system without appropriate authorization. The Enforcement Bureau ("Bureau") and Comtech Mobile Datacom Corporation ("CMDC"), by their authorized representatives, hereby enter into this Consent Decree for the purpose of terminating the Bureau's investigation into whether CMDC violated section 301 of the Communications Act of 1934, as amended ("Act") and sections 25.102, 25.117, 25.136(d) and 25.276(a) of the Commission's Rules by modifying and operating its mobile earth terminal ("MET") system without appropriate authorization. As part of the consent decree, CMDC makes a "voluntary" contribution to the United States Treasury in the amount of $25,000 and is required to make regular reports regarding technical parameters of system operation. Respondent proposes the adoption of the Battle Command Product Line (BCPL) Logistics software variant, Movement Tracking System. Enhanced Software (MTS-ES), (currently undergoing test), to stand up a new NOC [Network Operations Center] to host MTS running MTS-ES software, to ramp up the system as quickly as possible, and to undergo a transition period from legacy NOC to the new proposed NOC. Separate and apart from this proposal, the current plan is for MTS to adopt MTS-ES as its future software (assuming successful testing and user acceptance). However current schedules do not project the availability of MTS-ES until second quarter FY2011. The current MTS contract ends July 2010 which is 6 plus months before MTS-ES is projected to be available. With successful testing, acceptance, and availability of this software, MTS will no longer need to sole-source CMDC's proprietary components or require a prime contractor to use CMDC as its sub-contractor. Once the BCPL software is released, it will allow for MTS to have open standards, and this is expected to significantly increase competition for future contracts. L-band bandwidth, network management services, engineering design and development services, and the procurement of BFT-2 L-band satellite transceivers, during the years 2010 - 2015 and beyond supporting PM FBCB2 BFT operations worldwide. The PM seeks to procure the hardware and acquire the services, using multiple awards of Indefinite Delivery Indefinite Quantity (IDIQ) contracts. The total dollar value of each contract would be $477M. Starting in 2010 thru 2015, the Army wants to replace the current BFT-1 CMDC equipment with improved equipment that provides an order of magnitude improvement in data throughput. In September, CMDC repeats to the Government that the value of its ongoing business operations, the Government-wide application of Government Purpose License Rights, and the potential risks associated with releasing the proprietary data to unlimited industry competitors, would necessitate a minimum license price of $125 million with any data, documentation or other information provided in an "as is" condition with no warranties or guarantees associated with the license. The Government immediately determines that these terms and conditions are unacceptable. 2010 In July, the U.S. Army awards a $477 million IDIQ contract for the next generation FBCB2 Blue Force Tracking system (called BFT-2) to ViaSat, Inc. rather than incumbent Comtech Mobile Datacom. In response to this loss, Comtech stock (ticker symbol CMTL) drops by nearly a third in a single day, representing the extent to which the market valued the Army contract and the division's relationship with the military. Also in July, a Memorandum of Understanding (MOU) is signed that places the Movement Tracking System (MTS) office under PEO C3T, and thus under FBCB2. 2011 In May, the Movement Tracking System (MTS) Product Office offically moves under the Army's Program Executive Office (PEO) Command, Control and Communications-Tactical (C3T). Also in May, Comtech was notified that their BFT-1 contract was selected for a post award audit by the Defense Contract Audit Agency ("DCAA"). A post award audit (sometimes referred to as a Truth in Negotiations Act or "TINA" audit) generally focuses on whether the contractor disclosed current, accurate and complete cost or pricing data in the contract negotiation process pursuant to Federal Acquisition Regulations ("FAR"). At the end of June, after multiple rounds of layoffs, Comtech Mobile Datacom ceases providing commercial satellite service over North America. For the fiscal year ending July 31, payments from the BFT-1 and MTS contracts accounted for 40 percent of Comtech corporate revenue. Since 1999, Comtech delivered about 139,000 BFT-1 mobile satellite transceivers and 47,000 MTS units. In August, Comtech corporate offers to sell the rights to CMDC's intellectual property to the Government for $120 million. The Government declines. With the Army indicating it would contract for satellite capacity directly rather than through Comtech, during a September conference call to investors, Comtech officials indicated they would charge the government a separate fee for the use of the company's intellectual property. The defense industry in general poses social concerns for some investors. At defense contractor Comtech, the average director tenure is 18 years and only one director is under seventy; the board also lacks diversity with regard to gender. High average tenures and ages, taken together, suggest entrenchment planning concerns. Remuneration decisions are only loosely linked to performance, which has lagged peers and the S&P 500 for the last five years. Finally, a number of accounting flags suggest that expenses may be understated or possibly capitalized. Also in October, after a period of unexplained absence, Dan Wood resigns as President of Comtech Mobile Datacom. Management of the division is to be handled by Comtech AeroAstro, a sister division located in Ashburn, Virginia. Mr. Wood received a 2010 non-equity incentive award of $750,000 which was primarily based on the level of fiscal 2010 pre-tax profit achieved for the business operations for which he was responsible and the ECC's [Executive Compensation Committee] evaluation of his overall performance. The ECC considered the fact that the subsidiary Mr. Wood supervises was not selected as the program manager and vendor for the Blue Force Tracking 2 ("BFT-2") program because a third party vendor bid a price that was 50% lower than the price submitted by Mr. Wood's subsidiary. Ultimately, as a result of the expected future decline in sales and profits related to BFT-2, the Company recorded a goodwill impairment charge in its fiscal 2010 results. Mr. Wood was also awarded 20,000 shares of CMTL stock in June 2010, with an estimated value of $216,354. His total reported compensation for the 2010 fiscal year was $1,451,726. In addition, at the time of his departure Mr. Wood sold 42,000 shares of CMTL, netting $1,332,240. "As President of both CMDC and AeroAstro, Paul is the perfect candidate to further reposition our mobile data communications segment. I believe that Paul's experience in establishing AeroAstro as a leader in the emerging microsatellites industry will be beneficial as we continue to adjust our mobile data communication segment's business strategy." "I believe that the people and technology at CMDC are second to none and I am confident that Paul and the team will position our mobile data communications segment for future growth and continued profitability." The presentation also admits the transition (although not referring to it as such) of the Movement Tracking System (MTS) Network Operations Center (NOC) from Comtech's Germantown facility to the FBCB2 BGN at Aberdeen Proving Grounds. Subsequent to October 31, 2011, we received an order for $3.8 million to support the integration and establishment of an MTS network operations center within the existing BFT facilities by July 9, 2012. 2012 In January the Army awards Comtech short-term contracts for equipment and service. The intent of the Army is to acquire commercial satellite capacity through the DISA-GSA Future COMSATCOM Services Acquisition (FCSA) program rather than through Comtech. Through January 31, 2012, Comtech received $378,009,000 in total orders under their BFT-1 contract. During a March 9 investor's conference call, Chairman Fred Kornberg repeats his demand for payment from the Army and further maintains that even if the Army moves to other vendors for BFT-2 and satellite service, Comtech will still demand payment for the use of their "intellectual property." The specific terms and conditions related to the IP license are covered by a separate licensing agreement which provides for an initial licensing period that begins April 1, 2012 and ends March 31, 2013 and provides for annual renewals, at the U.S. government's option, for up to a five-year period, after which time the U.S. government will have a limited non-exclusive right to use Comtech's IP for no additional IP licensing fee. The first order under this contract established the IP license fee as $10.0 million for the initial period. 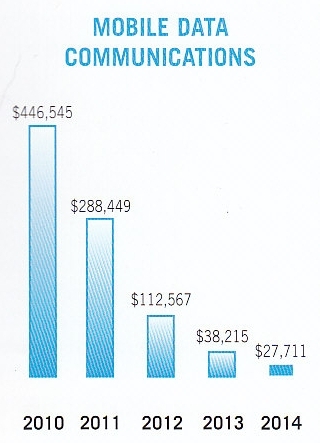 This amount is separate from any services, management or operations costs. In April, BFT-2 equipment from ViaSat begins official fielding, marking the start of a planned replacement program of BFT-1. In July, Comtech shuts down the AeroAstro division and lays off about 50 employees. In October some of the assets of AeroAstro are sold to San Diego-based Space Micro. In a Fourth Quarter investor presentation, Comtech again highlights their "Strong Track Record of Successful Acquisitions" with the inclusion of the line "Fiscal 1999 - Mobile Datacom - generated over $1.5 billion of revenue over 10 years." There is no mention of how Mobile Datacom created that success or of the individuals (now long departed) who made it possible. Like it did in fiscal 2011, our ECC decided to award lower total fiscal 2012 compensation to our NEOs (including our CEO), in part, as a result of the continuing impact to our business of the July 2010 decision by the U.S. Army to award the Blue-Force Tracking-2 ("BFT-2") contract to a competitor, and the U.S. Army's related decision to combine its Movement Tracking System ("MTS") program with the BFT program. While the U.S. Army's decisions did not have an immediate impact on our financial results, the July 2010 announcement of the loss of the BFT-2 contract to a competitor resulted in a 31.9% one-day drop in our stock price (which has not yet been fully recovered) and its loss will negatively impact our comparative financial results for several years. According to a filing made by Comtech to the Securities and Exchange Commission (SEC), in December Comtech is informed that a preliminary report by the government auditor (the audit conducted by the Defense Contract Audit Agency (DCAA) and the Defense Contract Management Agency) concluded that Comtech's pricing methods under the BFT-1 contract were unacceptable, and that the company would be asked to reimburse $11.8 million plus $2.3 million in interest. 2013 In June, Comtech receives the expected order from the U.S. Army for BFT-1 sustainment. The $15.8 million order includes the second year intellectual property charge of $10 million. In conjunction with a previous $5 million order, the remaining $10.8 million covers sustainment services including staffing of the BGN at Aberdeen and telehousing costs for hub equipment located at various satellite earth stations. In October, Comtech sells its Sensor-Enabled Notification System (SENS) to Orbcomm, Inc. for $2 million. Comtech reported in a filing with the Securities and Exchange Commission (SEC) that SENS generated about $4.6 million in revenue in the previous fiscal year. The sale includes hardware, network equipment and web platforms. SENS originated out of the now-defunct AeroAstro division and was designed as a one-way data delivery service using the inbound (mobile to ground station) links of first-generation Globalstar satellites. Paul Lithgow, President of Comtech Mobile Datacom Corporation, will also be leaving Comtech to return to Arizona and the aerospace industry. Paul joined Comtech in 2008 as part of AeroAstro (which was acquired in connection with the Radyne acquisition). Paul served as President of Comtech AeroAstro until it was wound-down in 2012, and had also become President of Comtech Mobile Datacom the previous year. Pres Windus will be returning to the role of President at Comtech Mobile Datacom, effective November 6, 2013. Pres previously served as the President of Comtech Mobile Datacom for three years between 2002 and 2005. He also served in various other capacities during his 29-year tenure at Comtech. Paul Lithgow will be available for consultation to ensure a smooth transition. Mr. Kornberg noted, "Paul Lithgow successfully stabilized the Mobile Datacom business over the past couple of years. We wish him the best as he returns to Arizona and avoids the cross-country commute that he has made over the past several years. We welcome back Pres Windus to Comtech. Pres knows the Mobile Datacom business, as well as Comtech as a whole. As such, I expect a smooth leadership transition in the coming weeks." 2014 In August, Comtech Telecommunications Corporation confirms publicly that it is "exploring strategic alternatives" that could include a merger or sale of the company. Comtech stock (CMTL) rises over the next three months and reaches a 52-week high of just over $40 per share. After considering various strategic alternatives to enhance shareholder value, including a possible merger or sale of the Company, the Board has determined that the interests of the Company and its shareholders will be best served by the Company remaining independent. Within a week of the announcement the company stock plunges to just over $30 per share. Our primary goal in the mobile data communications segment continues to be to provide the U.S. Army with outstanding support. Doing so should position us well to participate in any next-generation BFT platform. In fact, we have recently responded to two government RFI's that are effectively requesting alternatives to the BFT-2 transceiver. One is for a BFT-2.5 L-band transceiver to replace the current BFT-2 transceiver. The second RFI is for a dual frequency transceiver operating at both L-band and X-band. In December, the company announces that Dr. Stanton D. Sloane will become CEO and President of Comtech Telecommuncations Corporation no later than February 1, 2015. Fred Kornberg will continue as Executive Chairman of the Board of Directors. To improve company-wide operating efficiencies and offer more innovative and integrated solutions to our customers, Comtech will fully integrate the activities and business of its Germantown, Maryland-based subsidiary, Comtech Mobile Datacom Corporation, with its Tempe, Arizona-based subsidiary, Comtech EF Data Corp.